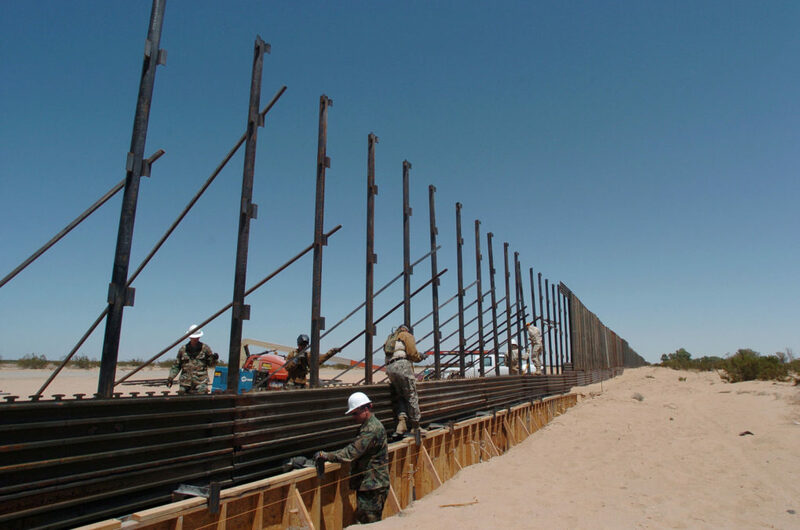 Members of the National Guard work on construction of a border wall between Arizona and San Luis Rio Colorado, Mexico, in 2006. President Donald Trump has pledged to build a wall along the entire U.S.-Mexico border, though the details remain unclear. As President Donald Trump settles into office with promises of swift action on immigration, security and his signature U.S.-Mexico border “wall,” what kind of barrier he aims to build could become clearer this week. But some current and former border officials say a new vast barrier would do little to help agents secure much of the 1,300 miles of remote border that lack fencing, even if Mexico somehow pays the multibillion-dollar tab as Trump has insisted. Benjamin Webb, who until last week was the executive director of the policy and planning office for U.S. Customs and Border Protection, said money would be better spent on more technology and incentives to recruit new agents. Leading up to Friday’s inauguration, the interpretations, explanations and clarifications of Trump’s assertions about the kind of wall he wants to build twisted and turned like bends in the Rio Grande. The direction the new administration plans to take may come as early as this week. Roughly 700 miles of fencing, almost all of it right along the U.S.-Mexico border, exists today to help agents patrol the line, along with cameras, sensors and other technology. Border officials say that in many areas, a fence may be pointless because nothing happens there. Along roughly 850 combined miles of the border, there is little to no traffic or illicit activity, Fisher said. The Border Patrol has developed ways to monitor those low-risk, often desolate areas using technology and analysis. Fisher launched an initiative in 2013, dubbed Skyfall, to study the flow of migrants and other crossers, using satellite imagery, maps and sensors to identify where resources are needed. Agents say fencing is effective in border towns and other high-traffic zones. The Homeland Security Studies and Analysis Institute, a federally funded think tank, found in 2011 that Border Patrol apprehensions plummeted in at least 75 percent of fenced areas. With shifting flows of migrants and smuggling tactics, Border Patrol agents, Fisher and Border Patrol Chief Mark Morgan agree that certain sections of the border probably require additional or upgraded fencing. Geospatial intelligence, Fisher said, clearly has shown that for years, traffickers and human smugglers largely have avoided certain parts of the border, including areas such as New Mexico’s Bootheel and the Big Bend area of West Texas, where there is a dearth of roads and infrastructure on either side of the border. Elsewhere, such as in the lower Rio Grande Valley, the meandering river and its floodplains make a wall impractical. Fisher said the notion that border fencing is meant to definitively stop people from crossing into the U.S. is a misconception. Instead, the fence slows crossers, giving agents more time to respond. It also requires constant maintenance and repair. “If people think that by just building a wall we can brush off our hands and walk away, they’re wrong,” he said. John Kelly, a retired four-star Marine Corps general confirmed Friday as the homeland security secretary, said as much in his Senate confirmation hearing, adding that a barrier alone is not enough. Whether or not those facts resonate with the Trump White House, plans and estimates for a border barrier already are circulating in Washington. One internal Customs and Border Protection estimate for building a 700-mile wall pegs the cost at $15 billion to $20 billion. A more modest approach would upgrade nearly 200 miles of existing barriers that could be fast-tracked for a quick Trump victory at an outside cost approaching $2 billion. Michael Friel, a Custom and Border Protection spokesman, declined to comment on those figures. U.S. Sen. Ron Johnson, R-Wis., chairman of the Senate Homeland Security and Governmental Affairs Committee, plans to hold a hearing Feb. 1 to examine how much fence exists now, what’s feasible to build and how much it would cost, an aide said. To better understand where the current fence lies – and what it could take to expand it – Reveal from The Center for Investigative Reporting analyzed data, studied satellite imagery and traced border maps to create the most detailed fence map publicly available. Construction of most of the current 650 miles of “primary” fence – first-line barriers that vary in height, design and length just inside the U.S. – began during President George W. Bush’s second term. The type of fence built depended on terrain and location, with nearly equal lengths of tall pedestrian fencing, meant to slow down unauthorized crossers, and vehicle barriers. In some places, the project dragged on for years, delayed by legal challenges and environmental concerns. The U.S. Department of Justice filed hundreds of condemnation lawsuits to gain access to and eventually acquire land where fencing was planned. A few of those lawsuits still are pending or were resolved only recently. In Roma, Texas, where proposed fencing would have cut off workers’ access to the city’s water pump, court records show the matter is unresolved, with almost no recent activity. The 2006 Secure Fence Act called for about 850 miles of double-layer fencing along five segments of the border. The amount later was amended to no fewer than 700 miles of reinforced barriers. Only 36 miles of that type of secondary fencing has been erected to date, according to government figures. The Border Patrol identified 90 potential fence sections and completed 75 of them, Adams said. Sometimes the landscape, such as towering cliffs in Texas’ Big Bend, negated fencing. But when originally asked where a fence could go, details like that were not stipulated, he said. Trump wasn’t the first to make shifting statements about the fence. During the Bush administration, a slip of the tongue inflated the number of miles identified for potential fencing. Instead of a goal of 770 completed miles of fence, as both then-Homeland Security Secretary Michael Chertoff and U.S. Rep. Lamar Smith, R-Texas, mentioned in public statements, the Border Patrol had estimated 717 miles of total fence, Adams said. At some point, someone mistook that for the larger number, which stuck. But the miles of completed fence fell below both figures because it wasn’t practical to build that much, Adams said. “Even with 717 miles of fence, we just didn’t know what we didn’t know” about the challenges in building the fence. The agency ended up building nearly 600 more miles to arrive at the current amount of about 700 miles, Adams said. The U.S. Government Accountability Office reported about 530 miles were built between 2005 and 2015. That included where the government could readily obtain and deliver building materials. At one point, officials considered buying concrete from Mexico, as it was easier to reach remote areas from south of the border, Adams said. But it wasn’t such an easy solution. Builders would have had to construct roads to the border that smugglers could have exploited. Mexican-made concrete also was not politically tenable. The agency, Adams said, did not have a way to import the concrete into the U.S., as there were no nearby ports of entry. In anticipation of the Trump transition team’s demands for a “great wall,” Border Patrol leaders have scrambled to prepare fencing estimates. The estimated price tag of $15 billion to $20 billion to build a wall 700 miles long mirrors other figures based on campaign statements made by Trump. Another $500 million could be needed to construct access roads and other infrastructure to build that barrier. That may not include maintenance and upkeep, which Customs and Border Protection reported cost at least $7.2 million in 2010, according to a 2016 Government Accountability Office report. Adams, now a private contractor who has consulted with the Trump transition team and briefed U.S. Senate staff on fence options, said the president could claim an early success by focusing on fencing where many costs and environmental reviews already have been addressed. The agency could complete design plans in 90 days and nail down construction contracts in 60 days, he said. A fast option calls for upgrading 184 miles of existing barriers to modern pedestrian fencing, where real estate already has been acquired and environmental reviews would need only to be updated, Adams said. 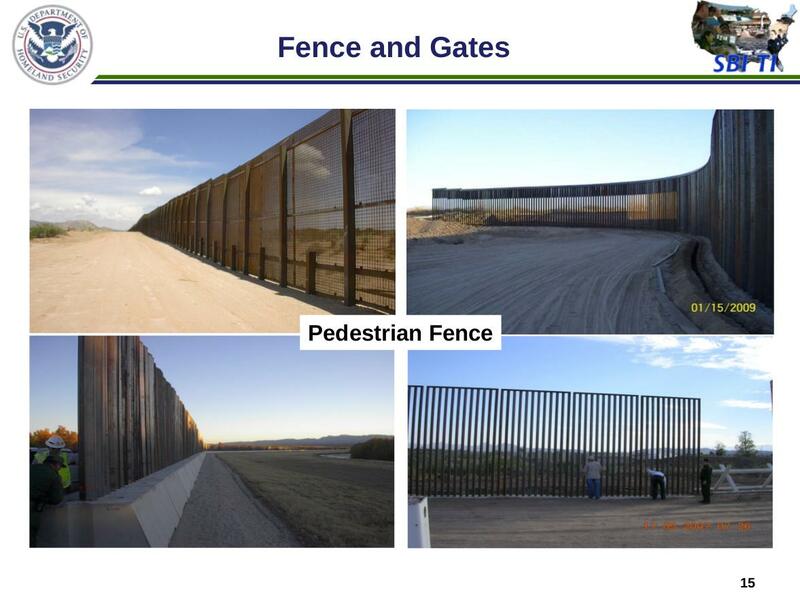 Adams said 34 miles of existing pedestrian fence constructed from steel helicopter landing mats from Vietnam could be upgraded in and around El Centro, California; Tucson, Arizona; and El Paso, Texas. He said the remaining 150 miles would entail beefing up vehicle fencing to taller pedestrian fencing, which could cost between $1.6 billion and $2 billion, depending on what gets built. “It’s not going to be cheap by any stretch of the imagination,” Adams said, adding that the estimated costs astounded congressional aides when he briefed them earlier this month ahead of an upcoming hearing. While officials from the National Border Patrol Council – the union that represents nearly 17,000 agents and backed Trump’s candidacy – say there’s wiggle room for what constitutes a wall, they’re confident something will be built. Brandon Judd, the union’s president, told NPR that there needs to be a few hundred more miles of reinforced barriers. Reveal senior news applications developer Michael Corey and researcher David Rodriguez contributed to this story. It was edited by Amy Pyle and copy edited by Nikki Frick. Andrew Becker can be reached at abecker@revealnews.org. Follow him on Twitter: @ABeckerReveal.